Taktsang means tiger’s den in Bhutanese language. It is the name given to clusters of temples built over a cliff. This famous site is popular amongst both Buddhists and tourists. 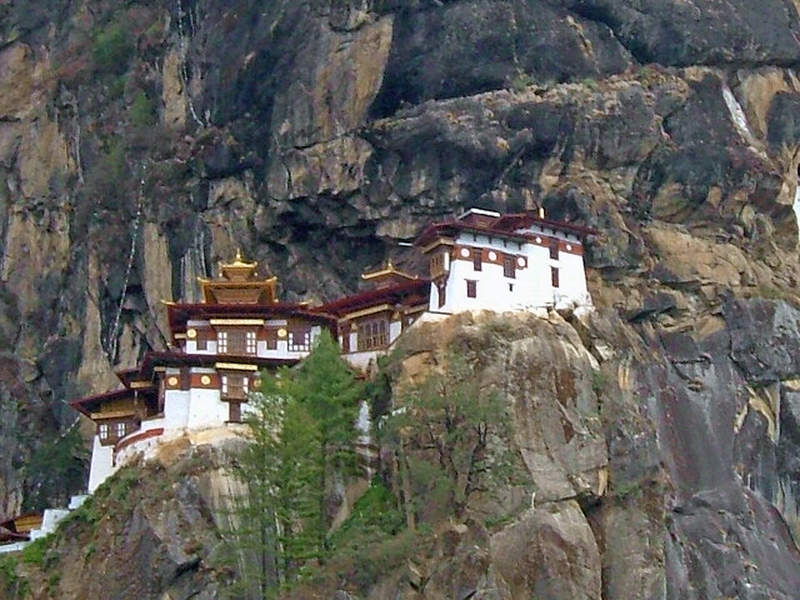 Situated in the district of Paro (western part of Bhutan), the tourist guides fondly refer to the site as Tiger’s Nest. So Taktsang, Tiger’s Nest or Tiger’s Den are names given to the place. For tourists and local pilgrims the trip is arranged for a day. Some ride horses uphill but most enjoy the trip by hiking to Pelphu which is the main temple. The trail is well maintained and broad. The climb is strenuous as one ascends almost 730 meters above the valley floor. Legend says that Guru Padma (the 8th century Buddhist teacher) flew to this place on the back of a flying pregnant tigress. I do not refute this legend. What I do to soothe my worldly mindset is convincing myself that this is a myth. Well, philosophies are built around it. Thereby myths enthral me. The teacher in question is the founder of Taktsang. He meditated here for three months. During the meditation he completed his idea on “Phurbu Tradition”. At an ordinary glance the Phurbu is a three-sided ritual knife (Kila in Sanskrit). Symbolically, each side represents a poison, referred here as Anger, Ignorance and Greed. Phurbu tradition is a teaching about subduing the negative aspects of these poisons. They are inherent characteristic requirement to human beings. We should not look at it as bad altogether. It is bad when these poisons are left untamed. While on a tour to Bhutan, an American tourist hilariously gave the acronym AIG to these poisons. She said that AIG (American International Group) suffered Liquidity Crisis that triggered global financial downturns in 2008. Interestingly, she reflects this crisis as mismanagement of anger, ignorance and greed, how interesting! Now how is the tiger associated to Taktsang, Guru and his teaching? For the Bhutanese the tiger represents strength and luck-force. Tigers are depicted on paintings and prayer flags. Such tradition gives the common folks a sense of refuge as they live their corporeal lives. To a Buddhist philosopher the tiger symbolises anger and aggression. These forces can change the world. Anger and aggression gone wild can result in unhappiness. The positive side of the story is taming this tiger within us. If we can harness our own anger and aggression then we create happiness. The Guru is depicted riding a pregnant tigress. The tigress here means human beings pregnant with anger and aggression. The symbolism of the tigress in flight means anger and aggression have no borders. Every human being possesses anger & aggression! The Guru riding the flying pregnant tigress is thus a climax. Let us transform the Guru as ourselves. Like the Guru riding, we are all riding the AA bomb (acronym used here for anger and aggression). We have a choice here: subdue the forces and live a happy life or let them untamed and create unhappiness. So, the concept of Guru riding the pregnant flying tigress remains a great metaphor to life. Apart from the philosophic interpretation of Taktsang and tigers, let’s see the natural side of tigers in Bhutan. Royal Bengal Tiger is the species found in Bhutan. The same species is seen in the lowlands of Royal Manas Wildlife Sanctuary (150 meters above sea level) to the nomadic village of Laya set at 4000 meters. Sometime back, Matt Walker – editor, Earth News of BBC showed Royal Bengal tigers thriving at high altitudes. Take a drive to Dochhu-la pass which connects Thimphu (capital) with Punakha. This pass, located at 3050m, is a scenic spot. Historic monuments and colourful prayer flags adorn this pass. It is a great bonus if you are there on a clear day. The views of almost all of Bhutan’s glacial peaks are seen from here. These peaks, some are close to 7500 meters, are the nation’s wild-gold reserve. These peaks feed many of Bhutan’s swift rivers harnessed for hydro power. While at the pass, look out for Mount Gangchentah to the extreme left of the panoramic chain of mountains. This peak is 6840 meters high and the name means the “Great Tiger Mountain”. The beautiful Snow Leopard trek that begins at Paro and ends at Punakha passes by this mountain. Lingmithang is the 8th night camp site and is just in front of the mountain. A night from here takes us to the nomads of Laya. Layaps worship this mountain as their guardian deity. For the nomads the Mt. Gangchentah is the home of the Great Spirit of tigers. The belief is that all tigers in the country take annual pilgrimage to this mountain. Looking at the tigers in the global arena, there are nine sub-species. Now three sub-species are extinct because of poaching and human encroachment on their habitats. These magnificent animals once roamed the entire Asian continent. Now they are restricted to few regions in the wild. Turning the clock back, 18th century poet William Blake, fascinated by the grandeur of the creature thus penned the poem titled “The Tiger”. This six stanza poem is so popular that many can recite the following stanza with ease. Tigers had been a wonderful creation and to lose them will be heart rendering. But looking through the lens of our contemporary livelihood, the tigers are diminishing. It is not the just tigers; we are all part of the extinction, if not careful. The views on contemporary life styles must change so that tigers could live free. To let the tigers live we must all tame the tiger within. So why not take a hike to Taktsang to tame the tiger? Boundless Journeys is an award-winning small group adventure tour operator. With a diverse collection of locally guided, small group itineraries and Private Collection trips around the world, Boundless Journeys offers “The World’s Great Adventures.” The adventure trips for 2-16 guests are active, ranging from leisurely cultural explorations and wildlife safaris to challenging trekking in remote regions ― with plenty of easy to moderate walking and sea kayaking in between.